How did you figure out all of the contents? Did it come with the recipe? Beautiful dish! I just played around with the original recipe. It called for parmesan, and I tried it that way first. It was OK, but I thought it could be better with Gruyere or Swiss, and it was! It also called for steaming the asparagus first, but that just seemed like a pain particularly since mushy asparagus is yucky. I love asparagus with eggs. This sounds great! That sound like a fabulous combination. I'm putting it into action as soon as I can get hold of some good asparagus. Thanks. I totally LOVE this concept for a blog... Definitely adding you to my reader, this is exactly what I strive for in cooking! This recipe looks really yummy. And asparagus is my favorite vegetable. I like it steamed, sauted, in salads, just anyhow. 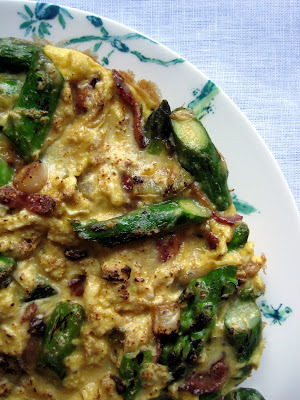 I have never had asparagus with eggs so I will definitely try this one. Yum. There isn't asparagus at the farmer's market yet, but I just couldn't wait, and did an asaparagus/egg dish myself last night. This is gorgeous and would be great for a fancy brunch too! Hi Maggie - it is indeed a great brunch dish, and one of our favorites to make! 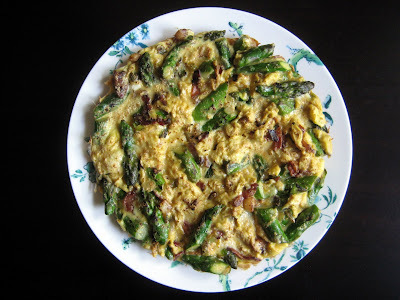 How did your asparagus/egg dish come out? Hope you post pictures of it on your blog! 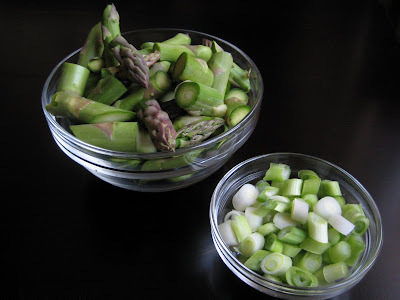 I am looking forward to the asparagus. Asparagus frittatas and quiches are the perfect way to welcome in Spring. Just made this for Mother's Day - it's a great recipe!! !